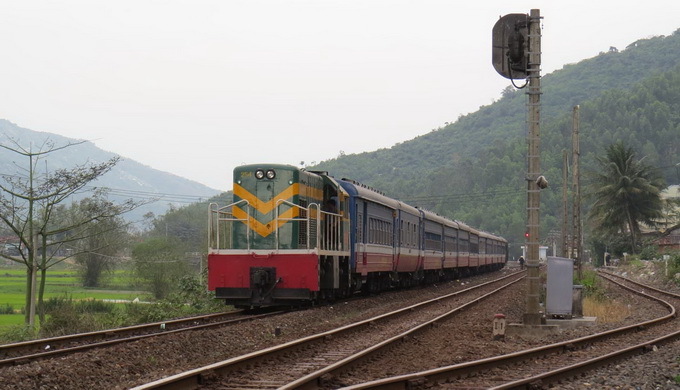 A train is pictured on the north to south railway system in Quang Tri Province, central Vietnam. A Chinese firm has expressed interest in setting up a railway system in the southern Vietnamese city of Can Tho, an authorized representative of the company said Friday. The railway would connect the Mekong Delta hub with Ho Chi Minh City and the Cambodian cities of Phnom Penh or Siem Reap, Kim Hak Min, Dean of Industry-Academy Cooperation with South Korea’s Soonchunhyang University, said during a meeting with the city’s administration. Kim is the urban development consultant for Can Tho, and has been authorized by the China State Construction Engineering Corporation (CSCEC) to propose the investment to the city’s leaders. The project includes the establishment of a complex of an industrial park, a retreat center, a residential area, and a hi-tech hub. It will be funded by an assistance loan from South Korea and other foreign sources. Can Tho currently has quite good traffic infrastructure in terms of road, sea and air transportation, but Kim believes the city also needs a railway system, he said. The railway will help cut transport costs and thus enable Can Tho to be more attractive to investors. The CSCEC has proposed building a 180km Can Tho – Ho Chi Minh City track, whereas the respective lengths of the services to Siem Riep and Phnom Penh are 320km and 243km, according to the South Korean consultant. The Chinese company said it is willing to fund the construction and will join hands with relevant Vietnamese agencies to operate the complete system, and share the profits, Kim elaborated. Asked why Can Tho should choose a Chinese contractor while Japan is better known for constructing railway systems, Kim said it is the price and time that matter, according to Phap Luat (Law) newspaper. One hundred meters of rail track constructed by Japan will cost $100,000, whereas it will be only $90,000 and $70,000 in the case of a South Korean or Chinese company, respectively, he elaborated. Man demanded an official investment proposition from the Chinese company so that the city can ask for feedback from the Ministry of Transport and the government. On June 6, a truck transporting the carcasses of five endangered primates was stopped in Nghe An Province.